Dr. Nieto is a Medicinal Chemist with a vast experience in combinatorial chemistry, natural products and drug design. He has work in therapeutic areas such as antiinfectives, opioids and selective estrogen receptor modulators (SERMs). 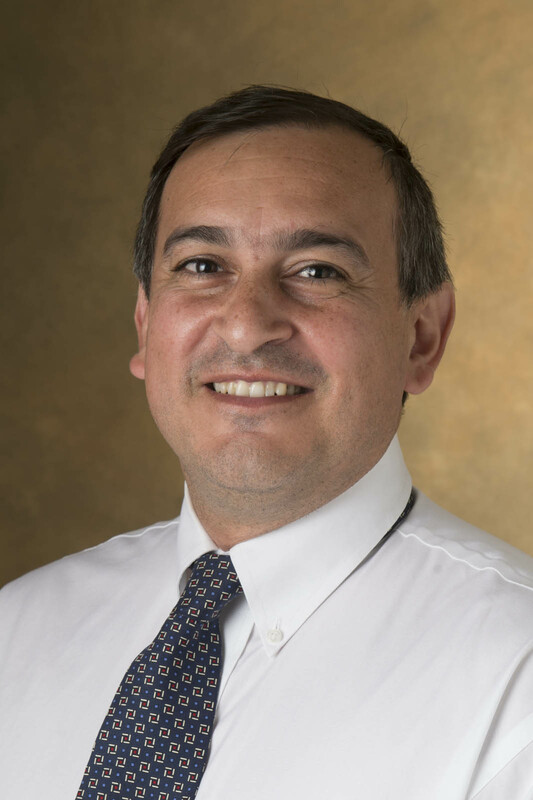 Dr. Nieto received his PhD in chemistry (medicinal chemistry) at the National University of Cordoba, Argentina, followed by a post-doc and a research scientist position at the University of Mississippi where he worked for six years. He moved to SIUE school of Pharmacy in 2006 and he is currently associate professor in the department of Pharmaceutical Sciences. His current research is focus on the rational design of combinatorial libraries of potential SERMs compounds. 1. M.Nieto, C. Li, T. McPherson, W. Kolling, E. Navarre. “Preparation and characterization of inclusion complexes of N-­â€substituted-­â€benzenesulfonyl heterocycles with cyclodextrins.” Submitted to the J. Pharm Sci. (March 2014). 2. F. Mora, Y. Rojas, V. Gonzalez, J. Velasco, T. Díaz, N. Ríos, L. Rojas, J. Carmona, B. Silva, M. Nieto. “Chemical Composition and in vitro Antibacterial Activity of the Essential Oil of Verbesina negrensis (Steyerm.) from venezuelan andes”. Nat. Prod. Comm. (Submitted April 2014). 3. H. Zollards, C. Santanello, M. Nieto. “East meets west: An infectious diseases case”. National Center for Case Study Teaching in Science. Online 4/4/2014. 4. F. Mora, L. Alpan, N. de Tommasi, V. McCracken, M. Nieto. “Bioactivity-­â€guided isolation of a new antibacterial germacrene from Verbesina negrensis”. Planta Med. (2013) 79, 707-­â€710, DOI: 10.1055/s-­â€0032-­â€1328542. 5. F. Mora, L. Alpan, V. McCracken, M. Nieto. “Chemical and Biological Aspects of the genus Verbesina”. Nat. Prod. J. (2013) 3 (2), 140-­â€150. 6. M. Nieto, A. Pierini, N. Singh, C. McCurdy, R. Manzo, M. R. Mazzieri. "A Theoretical Study of Antibacterial Benzenesulfonamides Fluoroquinolones (BSFQ)" Med. Chem. (2012) 8 (3), 349-­â€360. 7. R. Pagliero, R. Mercado, V. McCracken, M. Mazzieri, M. Nieto. Rapid and Simple Synthesis of N-­â€ Benzenesulfonyl derivatives of heterocycles and their Antimicrobial Properties. Lett. Drug Des. Discov. (2011) 8(9), 778-­â€791. Selected as “Editors choice” for this issue. 8. L. Hergert, M. Nieto, M. Becerra, I. Albesa, M. Mazzieri. “Synthesis of N-­â€ Benzenesulfonylbenzotriazole Derivatives and Evaluation of their Antimicrobial Activity”. Lett. Drug Des. Discov. (2008) 5(5), 313-­â€318. 9. B. Kane, M. Nieto, C. McCurdy, D. Ferguson. “A unique binding epitope for salvinorin A, a non-­â€ nitrogenous kappa-­â€opioid receptor agonist”. FEBS J. (2006) 273, 1966-­â€74. 10. M. Nieto, F. Alovero, R. Manzo, M. Mazzieri. Benzenecarboxamide Analogues of Fluoroquinolones (BCFQs). Antibacterial Activity and SAR Studies. Lett. Drug Des. Discov. (2006) 3(2), 108-­â€111. 11. C. McCurdy, K. Sufka, J. Warnick, M. Nieto. Antinociceptive Profile of Salvinorin A, a Structurally Unique Kappa Opioid Agonist. Pharmacol, Biochem and Behavior, (2006) 83, 109-­â€113. 12. M. Nieto, F. Alovero, R. Manzo, M. Mazzieri. "A New Class Of Fluoroquinolone: Benzene-­â€ sulfonamidefluoroquinolones (BSFQs). Antibacterial Activity And SAR Studies. II" Eur. J. Med. Chem. (2005) 40(4), 361-­â€369. 13. M. Nieto, A. Phillip, J. Poupaert, C. McCurdy. “Solution-­â€Phase Parallel Synthesis of Spirohydantoins Derivatives” J. Comb. Chem. (2005) 7(2), 258-­â€263. 14. C. McCurdy, M. Nieto, B. Kane, D. Ferguson. Non-­â€nitrogenous kappa opioid receptor ligands based on salvinorin A, a unique and naturally occurring opiate lead. Fundam. Clin. Pharmacol. 2004, 18, 597. DOI: 10.1111/j.1472-­â€8206.2004.00288.xC. 16. E. Muri, M. Nieto, J. Williamson. "Hydroxamic Acids as Pharmacological agents. An Update". Med. Chem. Rev. on Line (2004) 1(4) 385-­â€394. 17. M. Nieto, P. Rodríguez-­â€Manzanares, R. Manzo, M. Mazzieri. “Hydrophobicity estimations of benzene-­â€sulfonamidefluoroquinolones (BSFQs) by RP-­â€LC. Influence of chromatographic parameters in QSAR studies”, Med. Chem. Res. (2003) 12(2), 94-­â€110. 18. B. Bradbury, P. Bartyzel, T. Kaufman, M. Nieto, S. Scesney, B. Gaumond, H. Marsh, R. Sindelar. “Synthesis and Complement Inhibitory Activity of B/C/D-­â€Ring Analogues of the Fungal Metabolite 6,7-­â€Diformyl-­â€3’,4’,4a’,5’,6’,7’,8’,8a’-­â€octahydro-­â€4,6’,7’-­â€trihydroxy-­â€2’,5’,5’,8a’-­â€tetramethylspiro [1’(2’H)-­â€naphthalene-­â€2(3H)-­â€benzofuran]”. J. Med. Chem. (2003) 46, 2697-­â€2705. 19. E. Muri, M. Nieto, R. Sindelar, J. Williamson. "Hydroxamic Acids as Pharmacological agents". Curr. Med. Chem. (2002) 9(17), 1631-­â€1653. 20. F. Alovero, A. Barnes, M. Nieto, M. Mazzieri, R. Manzo. "Comparative study of new benzenesul-­â€ fonamidefluoroquinolones structurally related to ciprofloxacin against selected ciprofloxacin-­â€ susceptible and -­â€resistant Gram-­â€positive cocci". J. Antimicr. Chemother. (2001) 48, 709-­â€712. 21. A. Vilches, M. Nieto, M. Mazzieri, R. Manzo. “Structure-­â€Fluorescence Relationships in Antimicrobial Fluoroquinolones (AMFQs)”. Molecules (2000) 5 (3), 398-­â€400. 22. M. Nieto, F. Alovero, R. Manzo, M. Mazzieri. "QSAR of Benzenesulfonylfluoroquinolones Derivatives". Boll. Chim. Farm. (1999) 138, 433. 23. M. Nieto, F. Alovero, R. Manzo, M. Mazzieri. "A New Class of Fluoroquinolone: Benzenesulfonamide-­â€fluoroquinolones (BSFQs). Antibacterial Activity and SAR Studies". Eur. J. Med. Chem. (1999) 34 (3), 209-­â€214. 24. F. Alovero, M. Nieto, M. Mazzieri, R. Then, R. Manzo. “Mode of action of Sulphanilyl Fluoroquinolones (NSFQs)”. Antimicr. Agents Chemother. (1998) 42, 1495-­â€1498. A. Michael Crider, Marcelo J. Nieto, Kenneth Witt. “Central Dopaminergic Signaling Agents” (Chapter 13). Wilson and Gisvold's Organic Medicinal and Pharmaceutical Chemistry, John Beal and John Block, editors, Twelfth Edition, Lippincott Williams and Wilkins, 2010.